When you reach the size limit of your email Inbox, common practice dictates that you delete some of your emails to clear some space for new incoming email so they won’t be blocked and returned to the sender. It can be stressful especially when these new emails are of extreme importance. This is avoidable if you can do a quick scan of your Inbox and delete or remove large emails particularly those with large attachments. The problem is, Gmail does not provide such tools. In this entry, we will guide you to solve this problem with the help of Find Big Mail (FBM), a web application. FBM will identify the size of your emails, and sort them with labels directly in your Inbox so you can easily delete or move your big emails elsewhere to produce much-needed space, quickly and for free. Lets start this tutorial by visiting FindBigMail.com. Here, you need to type in your personal Gmail or Google Apps account username in the text box and click on that big orange button that says ‘Find Big Mail’. 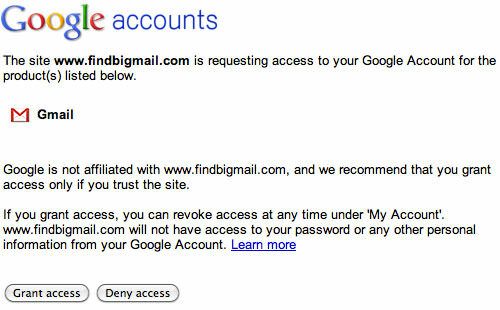 Of course your account is private, and since only you can access your email, you need to give permission, which you can revoke anytime under your ‘My Account’ settings, to Find Big Mail to access your data. Now that you have completed the process, all you have to do is just wait for the search results — it takes between five and sixty minutes to sort everything out, depending on the size of your Inbox. In the event that the results do not appear, click on the ‘refresh’ button, just to get things moving. When the results are ready, the following pie chart will appear, tabulating the emails from your Inbox categorized by size. FBM will also send you an email containing a detailed report with links to specific larger emails, so you can focus your attention there. Check, delete or move these larger emails elsewhere to unclutter your Inbox. As you can see in the image below, on the left are the top 3 biggest message links to direct you to the specific emails. Apart from the email report by FBM, you will also receive new labels created as shown in the first image of this tutorial. 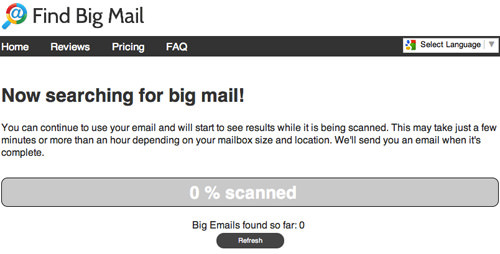 Now you can simply navigate using these labels to find specific emails by size. You can use the service for free; not a single dime is charged unless if you need to check your Google Apps account. Using FBM with your personal Gmail account is definitely easy, but you may be concerned about the security of your personal email (it is like giving a stranger unlimited access to your email account). However, as mentioned on the blog, two security sites, namely Norton Safe Web and McAfee SiteAdvisor have done separate independent scans on the FBM service application and confirmed that the site is safe for use according to their detailed checklists. So worry no more and start clearing out the mess.